Woodlands School accommodates up to 72 physically disabled children between the ages of 2 and 16 years. Many of the pupils have additional difficulties that may affect their learning. 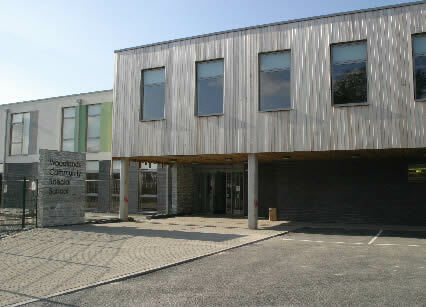 The school is a Plymouth City resource; however, pupils also travel from Devon and Cornwall to join the school. The school is divided into three teaching departments. Early Years and Nursery; Primary i.e. Foundation Stage, Key Stages 1 and 2; and Secondary for pupils at Key Stages 3 and 4. Teaching is based on the National Curriculum and pupils have both group and individual learning programmes. Key Stage 4 pupils follow nationally accredited courses: 8 GCSE courses can be followed where appropriate,and other courses are available for pupils who achieve at a slightly lower level. A wide range of extra curricular activities are offered from boatbuilding to art. There is an exceptional assessment pack to ensure pupils' targets are maintained. They regularly outstrip the targets set within IEPs and Annual Reviews. Key Stage 3 results have been excellent and the variety of KS4 accreditation has expanded. This has given many more pupils the opportunity to leave with a range of qualifications. Facilities include spacious classrooms, some of which are subject related, wide corridors, light sensory rooms, hydrotherapy, rebound, soft play and ball pool, every classroom has interactive whiteboards and there are sufficient computers for all pupils. The school residence offers weekly boarding and nightly respite in one and two bedded rooms for pupils at Woodlands School and those with a mobility or medical need attending Downham and Millford schools. The residence is open all year round; weekend and holiday respite is agreed and funded via Social Services and the Health Authority. Many pupils and their families benefit from one or 2 nights per week residential respite. Staffing includes teachers; nursery nurses, teaching assistants, nurses, administrators, caterers, caretaker and cleaners. The Health Authority provides Physiotherapy, Speech and Language Therapy and Occupational Therapy when appropriate. Twenty-four hour nursing cover is provided. Emphasis is always placed on pupils becoming independent learners and there is a strong tradition of inclusion. Many pupils experience mainstream school opportunities for part of each week, normally supported by a classroom assistant from Woodlands; some pupils, after a transition period, transfer to their local mainstream school full-time. The LEA provides the transport.